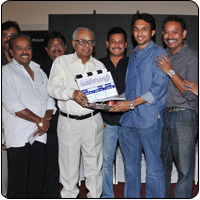 Kanimozhi, a new Tamil film was launched this morning at Hotel Green Park, Chennai. This film is being produced by Amma Creations and actress Sona’s Uniq productions. Sripathy who had worked under Venkat Prabhu right from his Chennai-28 days will be wielding the megaphone for this film. Sripathy had narrated a script to Venkat Prabhu who had liked it a lot and had conveyed the same to Siva of Amma Creations who in turn had related to Sona and she agreed to be a co-producer of the film. Incidentally Sona also will have the worldwide distribution rights for Kanimozhi. A very interesting aspect about the launch event was that the release date of the film was announced as 5th August 2010 which is considered very unique. Jai will be the hero of Kanimozhi while Shahzahn Padamsee who featured in Rocket Singh Salesman of the year along with Ranbir Kapoor is the lady lead. Shahzahn is the daughter of adman Alyque Padamsee and pop singer Sharon Prabhakar. Vijay Vasanth also plays an important role in Kanimozhi. When Cheran rose up to speak, he put forth a general request that along with shawls and mementoes, achievers should also be given some form of fixed asset like a plot or a land which would really be helpful and motivational. Director Vasantha Balan whose Angadi Theru will hit the screens tomorrow appealed that his name also be included in the beneficiaries list. He contradicted veteran K Balachander and said, “I have always been in awe of Bala’s style of work, his pride and his obstinacy. People here have told you to cut short the duration of your work. But please don’t do that. It may take 3 or 4 or 6 or 10 years. But don’t rest till you get the required output. Please don’t bow down to these demands.” His speech created some kind of uncomfortable feeling among the audience. He also lamented that when he went to inform about the Cannes award for Veyil at the Director’s Council, they were not aware of the magnitude of it and asked him to stick the announcement in the notice board and leave. The event was anchored by Naazar and was attended by Venkat Prabhu, Premji, Sona, Jai, Vijay Vasanth, Ramanarayanan, Kalyan- President of Film chamber of commerce, K S Ravikumar, Hansraj Saxena of Sun network among others.